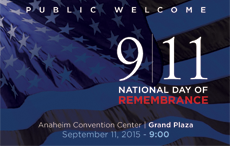 Please join us for the September 11 Remembrance Ceremony on the Grand Plaza at 9:00 a.m. Anaheim Fire & Rescue, Anaheim Police Department and Visit Anaheim are joining together to pay tribute to the victims of September 11, 2001 and to honor those emergency personnel and civilians that were lost on this day in history. Community members, residents, active and veteran military personnel, business owners and first responders are invited to attend. Complimentary parking with validation will be provided at the Hilton Anaheim / Anaheim Convention Center Car Park 2 which is accessible from Katella Ave. or Harbor Blvd. off Hotel Way.